A new weather system arriving from the Atlantic will clash with freezing air coming from Siberia causing significant snow coverage on Friday. The snowfall will hit Scotland and northern England the most, but most of the country will wake up to a white dusting on Friday morning, BBC's Carol Kirkwood warned. Ms Kirkwood said: “As we go through the evening on Thursday temperatures continue to drop and rain is starting to push in. “This rain is readily turning to snow, so if we look at the pressure chart here comes the rain bumping into the cold air. “So you can see where we’ve got the snow coming in across the west. “Significant snowfall particularly with height across Scotland and northern England. 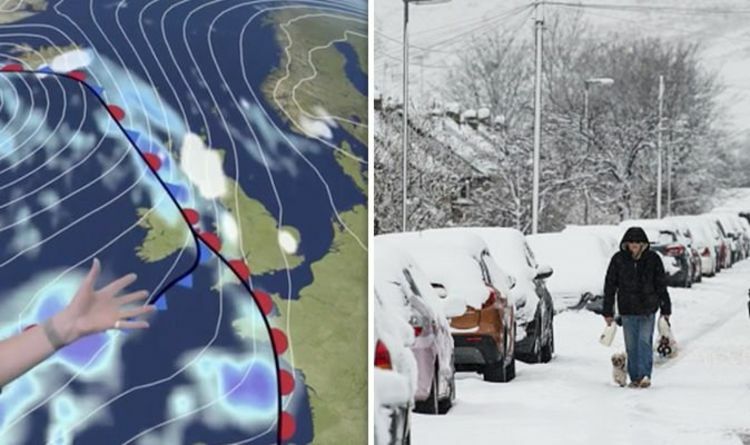 Snow will fall over the Grampians and the North York Moors, with Thursday being “a particularly frosty one across the country”, the Met Office also warned. The most snow will fall over the weekend, however, with 26cm in parts of Scotland. Wind will make the cold feel even colder in the east and will be especially strong in the west with gales developing across western parts of Scotland. Around coasts and hills gusts will reach over 50mph, causing meteorologist Aidan McGivern to warn the UK to “watch out for that”. Met Office forecaster Aidan McGivern said: “Because of the clearest skies and the lightest breeze will be in the east. “Here, temperatures will drop to -1 or -2 degrees before coming up a little bit by dawn. Mr McGivern said: “On Thursday morning we do wake up to a frost with some clear spells allowing temperatures to fall away in central and sheltered spots of England and Scotland.